Soft-core or Stiff-core, what's the difference? Can you make a special belt that I don't see on your site? Can I get three or four lines of embroidery on a belt end? Can I see an image of the belt before you embroider it? How long will it take to receive my embroidered belt? Where is the seam on Kataaro belts? Will you embroider my existing belt? What is the difference between Japanese kanji and katakana? Do I need to provide the Japanese translation? Can I have embroidery with coarse language? How do I wash my martial arts belt? Do you offer silk-screening (screen printing) on uniforms? Why did my credit card get charged twice? How do you pronounce "Kataaro" and what does it mean? We recommend considering actual belt length rather than belt size since there is no industry standard for belt sizing. Please take into consideration the -2" and +3" tolerance for length. Also, the width of the belt will effect belt sizing. Since a wider belt will take up more of the belt length in the knot, a bigger size may be needed for a wider belt. We suggest using our belt size calculator to help determine the correct belt size. Try our calculator. Stiff-core is slightly stiffer (I know, obvious), and slightly thicker. Stiff-core is about 5mm thick as opposed to 4mm thick for soft-core. See video. If you wash your belt, it may shrink after the first wash. If you do not wash your belt, it may shrink over time due to sweat and wear. Our poly/cotton belts may shrink up to 3%. Our brushed cotton belts and Grappling Weave belts may shrink up to 8%. Keep this in mind when choosing what size belt to order. Belt shrinkage will NOT harm or affect the embroidery. We can custom make most any belt. Send us an email with the details and we'll let you know what we can do. Maybe. Depending on the size of the lettering and the width of the belt, you could get at least three lines of embroidered text on the belt. You will need to email us with the request since the website will not allow more than two lines of embroidery. Yes. We will provide you with a layout of your embroidered belt or uniform (in PDF file format) for review and approval before starting the embroidery process. We will not begin embroidery until we receive your approval. We ship using UPS and U.S. Postal Service (USPS), offering a variety of service options. Shipping cost is based on weight, package size and shipping location. You can calculate your shipping cost in the shopping cart prior to checkout by clicking "Shipping Rates". When looking at the end of the belt with the Kataaro label, the seam is located on the right side (where the "O" in "Kataaro" is). When tying a Kataaro belt as shown in our Belt Tying instructions, the belt seam will be up on the hip. After the knot is completed, the seam on the belt ends will face inward towards each other. This leaves the outside edge of the belt ends smooth and creates a clean look. If you prefer to have the seam down on your hip when tying your Kataaro belt, but still want the Kataaro label end of the belt to lay on the right side of your body, you can request to have the label moved to Side 2. Border belts have NO seam at all. Belts with Front-Back or Front-Only embroidery will have a seam on both edges. We will embroider your existing martial arts belt or uniform. Just send it to us with the embroidery details as well as your contact and shipping information. We will contact you with a price quote. You can find our shipping address on our Contact Us page. Japanese katakana are phonetic Japanese characters, each representing a particular sound. Katakana is typically used for words not familiar to the Japanese language. Your English (or non-Japanese) name will typically be translated using katakana. Japanese kanji are traditional Japanese characters, each with a meaning. It is not typical to translate your name into Japanese kanji, but if your name's meaning is available, it is possible. For your name in kanji, please specify this in the Special Instructions section. Other words that are familiar to the Japanese language will be translated using kanji. If you have the Japanese, Chinese, or Korean characters, please provide them since you may have a unique translation. Otherwise we will translate it. Kataaro reserves the right to refuse production of artwork or language that may be deemed offensive. Packaging tape can sometimes work to lift surface dirt from your belt. We recommend that you don't wash your martial arts belt due to possible shrinkage. If you must wash your belt: First, wash separately in cold water on gentle cycle with mild detergent and fabric softener if desired (DO NOT use bleach). Then, immediately after washing, gently stretch the belt back to its original length. 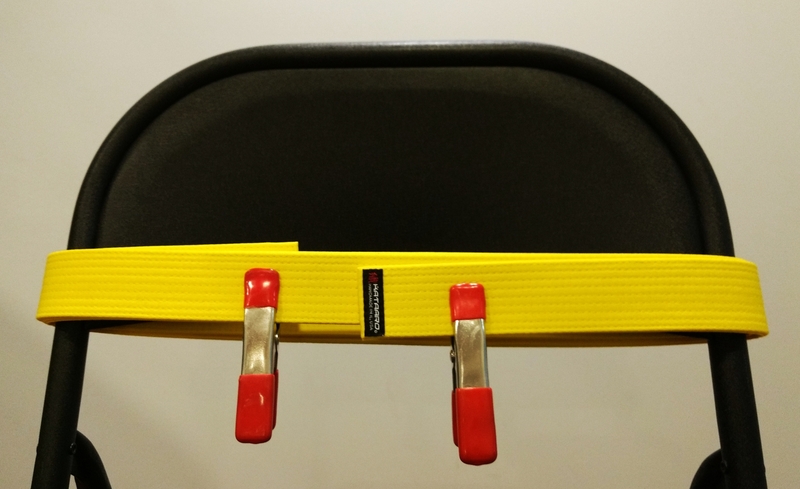 Finally, clamp the fully-extended belt to a rigid object, such as a metal chair back, to air-dry (example). Do not use a laundry dryer. Washing your belt in this way will NOT affect the embroidery. Yes. We offer wholesale accounts to school owners / operators only. To request a wholesale account, send us an email with your company information. No. Embroidery is better anyway. The best way to cancel your order is to call us during business hours as soon as possible, but you can send an email to info@kataaro.com with your order number as the subject line. If you have not paid for your order, we can cancel the order immediately. If you have paid for the order, your belt may have already been started being made. If this is the case, we can refund you the amount of the order, minus a restock/cancellation fee. Since Kataaro items are custom, we reserve the right to not accept certain cancellations based on the ability to resell the item. Some features that may affect the ability to resell are large or narrow width, stiff firmness, rank stripes, and features not listed on the website. It didn't. More than likely you made multiple attempts to charge your card while entering the wrong credit card information. Your bank is temporarily listing it in your records. This too will pass. It is pronounced ka-ta-ro. That's ka (as in karate), ta (as in top), ro (as in row). The name Kataaro comes from the family name meaning "weaver", which speaks of the history of this craft in our fine products. When you see a belt or a uniform with a school logo embroidered on it, that design was "digitized". Embroidery digitizing is the process of converting existing artwork, like a company logo or team emblem, into a stitch file that an embroidery machine can sew on a garment. Before any design can be embroidered, it must be digitized. Digitizing is a complex process that is both a skill and an art.